Where did quiltingintheloft.com come from? ...... Well it has been a long but fun journey. I actually started quilting based on the influence of my great grandmother's and her utilitarian quilts made from repurposed clothing. See photo below of my great grandma's hand quilted postage stamp quilt made from old clothing - I figure it to be over 100 years old. I'm honoured to have it! After the initial exposure to quilting, I became an enthusiastic child "crafter and sewer" and as a married adult started to do custom hand quilting and then moved to Windsor Ontario, took some machine quilting classes and was inspired enough to open a store "Borders Quilting and Sewing" for 5 years from 1999 to 2004. I think that with my wonderful staff, we tried our best to inspire some new quilters in Windsor and Essex County! Due to a career & family choice, I returned to my Social Services career and continued to be an avid (sometimes fanatical) quilter. If you ever have the opportunity to visit the City of Windsor have a look at the quilt that I was commissioned to do "Pathway to Progress" It's in the Reception area for Social Services, a 4 ft by 7 ft landscape quilt with a very hopeful message. 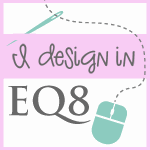 I am now located in Waterloo- due to my husbands career move and embarking on a long arm quilting business and quiltingintheloft.com (my loft is where I actually do the quilting) with enthusiasm!!! Stay tuned for a photo of my quilt "Pathway to Progress"